Cosy port-in-a-storm for salty old sea dogs everywhere. 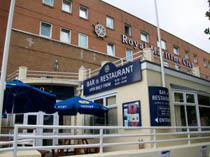 Located just around the corner from the Portsmouth Harbour Rail Station. If you are in Portsmouth looking for a relatively cheap and authentic naval experience then you could do worse than the Royal Maritime Club which has concessions for ex-naval personnel and assorted salty old sea dogs. Located just around the corner from the Portsmouth Harbour Rail Station, the Royal Navy Museum and the VUE Cinema, the hotel is ideal for trips to HMS Victory and the Mary Rose as well as shopping at the Gunwharf Quays Shopping Centre. All of the modern rooms feature a TV, free tea and coffee and a private bathroom. Whilst the name suggests something of a dormitory or cabin character but this couldn’t be further from the truth as the en suite accommodation comes equipped with a range of modern conveniences including broadband wi-fi and satellite television whilst the bridal suite offers up a Jacuzzi and complimentary sparkling wine and flowers.